In some ways, I really wish I could avoid this post. Everyone’s talking about the Lost finale and offering these incredibly eloquent reviews and retrospectives on the series. I love that so many people love to discuss this show; I think it’s a wonderful sign for television criticism (both academic and not) and especially for the evolving relationship between “quality” and “genre” labels. I, however, am somewhat intimidated by the cacophony of voices in the discourse of Lost, especially in academic circles, and am trepidatious about discussing a show that so many people love but that I only like. But I am a television scholar focusing on religion and genre television, and once I commented on Louisa Stein’s take on the finale, I realized I had to do it. I watched the Lost finale live with a friend who loves the series, so I tried to curb my less-than-favorable reactions to the final scenes in the church for her sake. I understand what it means to mourn a series, and I didn’t want to tarnish that, but alone moments later all I could do was compare “The End” to Supernatural‘s fifth season finale “Swan Song,” and the former suffered from the comparison. There are quite a few interesting parallels between the two, but there seems to be so few people who are invested in both, that Stein’s comparison is the only one I’ve seen. 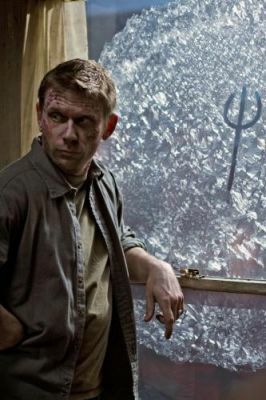 Lost and Supernatural operate on vastly different scales: Lost is an epic with an enormous cast and sprawling sets and locations, while Supernatural had no standing set until the third season and a cast of regulars that has grown from two to four over five seasons. Yet they share similar ambitions, especially regarding their overall worldviews. Both shows frame their narrative mythology in Christian terms but leave plenty of room to play with non-Christian and sometimes non-religious symbols, themes, and messages. The ultimate concern of both series seems to be that salvation can be achieved through humanity and its expression through love and communitas on earth. I must first–admittedly briefly and, for now, through broad strokes–analyze the Christian frames to the shows’ mythologies in order to argue why Lost (perhaps unintentionally) denies its ultimate concern by focusing on the afterlife in the last 15 minutes of the series. Both Lost and Supernatural may make gestures to a more Universalist idea of religion, but these gestures are contained by Christian symbols. This containment becomes clearest in Supernatural‘s “Hammer of the Gods” and in Lost‘s “The End.” In “Hammer of the Gods,” Kali tells the Winchesters, “Westerners, I swear — the sheer arrogance. You think you’re the only ones on Earth? You pillage and you butcher in your God’s name. But you’re not the only religion. And he’s not the only god. Now you think you can just rip the planet apart? You’re wrong. There are billions of us, and we were here first. If anyone gets to end this world…it’s me.” Kali seems to act as an acknowledgment of other religions’ importance and their own apocalyptic narratives and prophecies, but the episode culminates in Lucifer easily decimating the gathering of non-Christian gods, implying that the Christian figure of the Devil is more powerful than Norse, Taoist, Greek, Hindu, and animist gods. Christianity is the frame for this particular narrative, giving Lucifer the power over other gods, but not over humanity. Lucifer is ultimately himself contained by the willpower of Sam Winchester because of his brotherhood with Dean and their shared human experiences in life. Similarly, Lost visualizes other religions within a church that acts as a way-station to the afterlife. 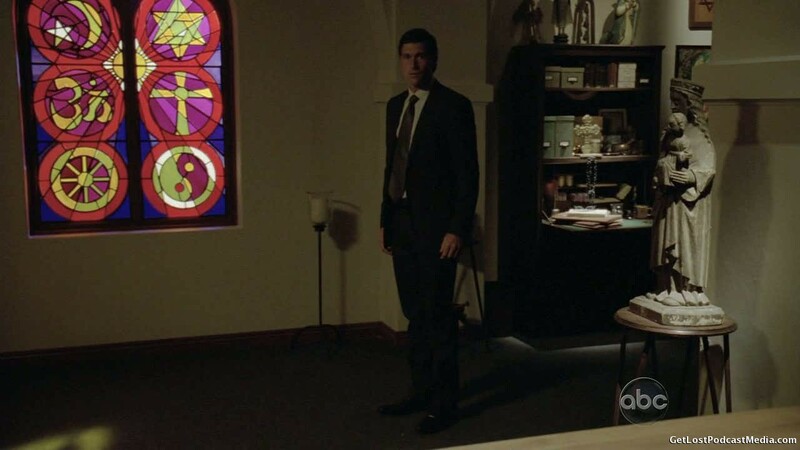 In the quarters of the church, Jack encounters symbols of almost every world religion, most clearly in the stained glass window that acts as the backdrop to his emotional and revelatory discussion with his father. While the stained glass window does contain symbols of (from top left to bottom right) Islam, Judaism, Hinduism (and other Indian religions), Christianity, Buddhism or Jainism, and Taoism, the symbols and the window are all contained within a church. Architecturally and symbolically, Christianity holds all the other represented religions, a point further supported by the character Christian Shepherd leading the castaways into the white light over the church threshold that is flanked by two angelic fonts. The problem is that Lost contains these religions in the afterlife. It may be a creation of the characters inhabiting it, but its nature as “the afterlife” ties it to a larger, transcendent power. This sanctions the containment in a way that Supernatural doesn’t. In the latter, Lucifer may appear to cut a swath through the other gods, but the episode is ultimately a Trickster episode, signaling that there may be alternate explanations, that everything may not be as it appears. Moreover, Kali, the character who acts as voice of the ignored or minimized non-Abrahamic religions survives. She still exists to prove that Christianity is “not the only religion.” I read Lost‘s afterlife church as a statement of Christian “Truth;” all of the castaways, regardless of creed, gather in a church to “move on,” presumably to heaven as the heretofore “sideways-verse” had been mostly happy and positive–and the whole being led by (the) Christian Shepherd past the gates bit. Half of the sixth season was devoted to events in the “sideways” realm that is revealed to be the afterlife; thus, the focus in the final season retroactively shifts from the relationship between two alternate earthly lives to the relationship between a life on earth and the afterlife beyond earth. On the island in “The End,” Jack insists that “All of this matters,” but in the church afterlife that becomes patently untrue. To a degree, the characters’ experiences on the island matter–and certainly matter from a character standpoint–but including relatively short-lived characters like Boone, Libby, or Ana-Lucia (who may not have been “ready” but is still existing in the afterlife-anteroom reality) emphasizes for the narrative the event and survival of the crash over the life led thereafter. We know nothing about Sawyer, Kate, or Claire’s lives after they left the island, nor do we know how Hurley and Ben governed the island after Jack’s death. I would be fine with not knowing these things except for the knowing about what happens after they all die and subtly insisting that knowledge is what really matters. The reunions, the recognition of love and communitas, that had previously made me giddy with happiness now seem hollow because that happiness now seems only possible after life. The choice is no longer “Live together, [or] die alone;” instead, it’s “Live together in order to die together.” The tragedies and victories of life become important only in that they lead to a happy afterlife. Supernatural takes the opposite view. Any glimpse of the afterlife is always directly connected back to earthly life. Dean goes to hell so that Sam may live, and Sam jumps into the Pit to contain Lucifer, save Dean’s life and the world. 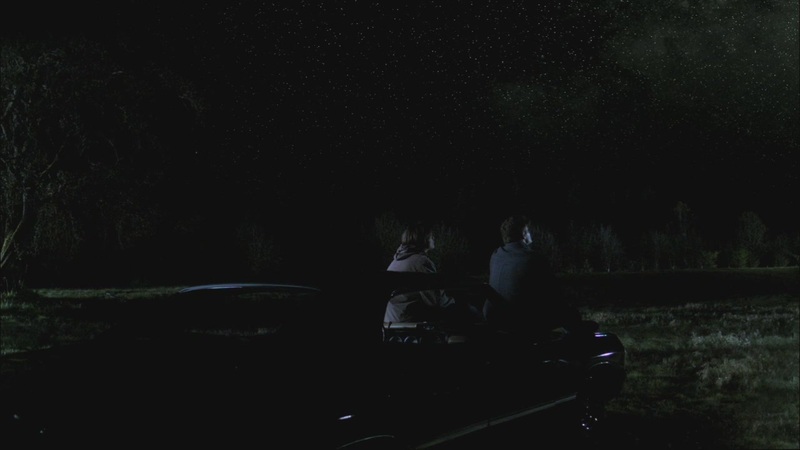 Both Winchesters briefly visit heaven in “Dark Side of the Moon” but find it full of memories from life and lacking as a result. Dean says, “That’s not Nivana; that’s the Matrix;” Heaven is many simulations of life with each individual existing separately from others, and it’s anything but pleasurable to the Winchesters. Every visit to an afterlife is used to cement life on earth as the most important realm of existence. Earthly tragedies and victories mean everything on Supernatural because life is where it all happens. Winchester brotherly communitas may extend beyond life–instigating both brothers’ trips to hell and shaping their shared axis mundi in heaven (an exception to the separation rule)–but on earth and in life their bond is formed, cultivated, tested, and affirmed. If Lost ultimately undermines salvation through humanity on earth by shifting emphasis to communitas after life, Supernatural has continually underlined salvation through humanity on earth by minimizing the power and possibility of communitas beyond earth. If salvation is to be found, it is through human bonds on earth, and it is all the more precious for being limited to one lifetime. This entry was posted in Uncategorized and tagged communitas, humanism, lost, metallicar, narrative, religion, supernatural, text, tv. Bookmark the permalink. killin it charlotte. bangin post. keep it poppin.